The human body is not designed to sit at a desk all day at work. We feel energized and revitalized when we can move our sitting or standing position during the day. The Ergo Desktop Kangaroo family of adjustable height desks are designed give you the ability to alternate between standing and sitting. 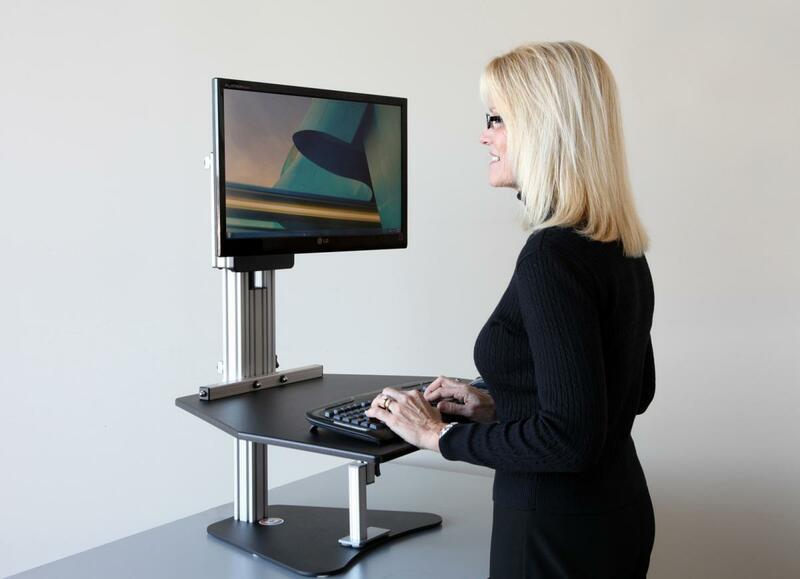 They also allow you to position your keyboard and monitor independently and set them at the proper heights. Now you can make a smart decision to improve your posture during the workday. 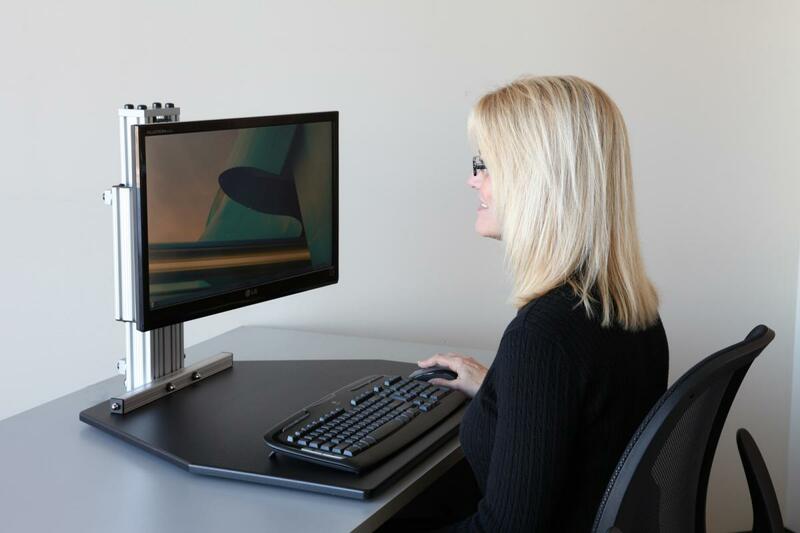 The Ergo Desktop dual ergonomics allow you to independently adjust the keyboard and display to assure you have the proper ergonomic position when standing. When sitting the height adjustable Ergo Desktop work surface rests conveniently on your desk. It remains unobtrusive as you work in the sitting position. 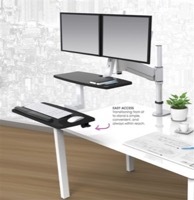 Ergo Desktop Adjustable Workstation - Adjusting the height of a work surface can dramatically increase the ergonomics of the workspace and the well being of each work associate. This adjustable work surface allows for the correct ergonomic height for multiple tasks - quickly and effortlessly. 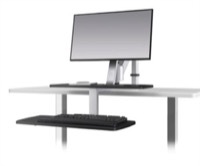 Ergo Desktop Adjustable Workstation - Adjusting the height of a work surface can dramatically increase the ergonomics of the workspace and the well being of each work associate. This adjustable work surface allows for the correct ergonomic height for multiple tasks - quickly and effortlessly. The height of a work surface can dramatically increase the ergonomics of the work space. With height adjustability, ESI Ergonomic Solutions' Adjustable Work Surface allows for the correct ergonomic height for multiple tasks - quickly and effortlessly. The height of a work surface can dramatically increase the ergonomics of the work space. With height adjustability, ESI Ergonomic Solutions' Adjustable Work Surface allows for the correct ergonomic height for multiple tasks - quickly and effortlessly. The height of a work surface can dramatically increase the ergonomics of the work space. With height adjustability, ESI Ergonomic Solutions' Adjustable Work Surface allows for the correct ergonomic height for multiple tasks - quickly and effortlessly.